It is with great pride that I would like to report my successful completion of my Girl Scout Silver Award. 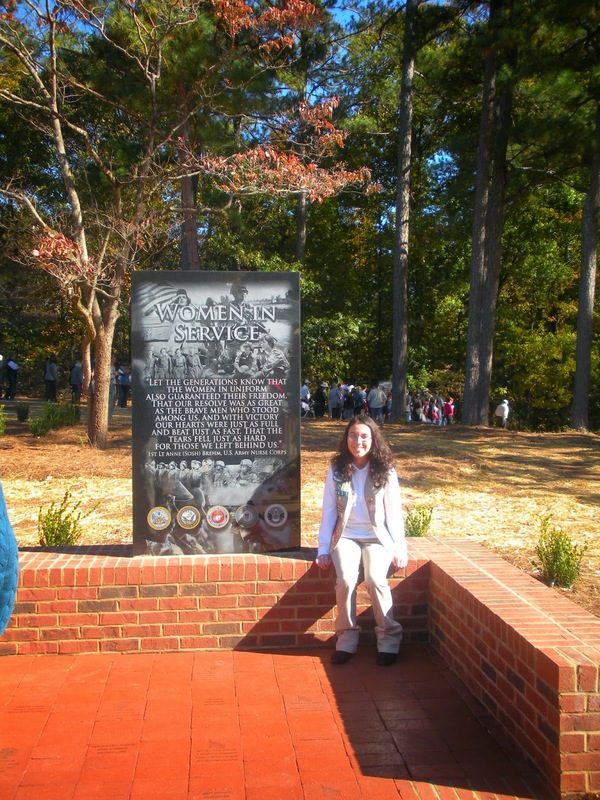 If you have followed my previous articles on my Girl Scout Silver Award, you can recall that two years ago I set-out my ambitious goal to help The Johns Creek Veterans Association in the development of a Veterans Memorial Walk. 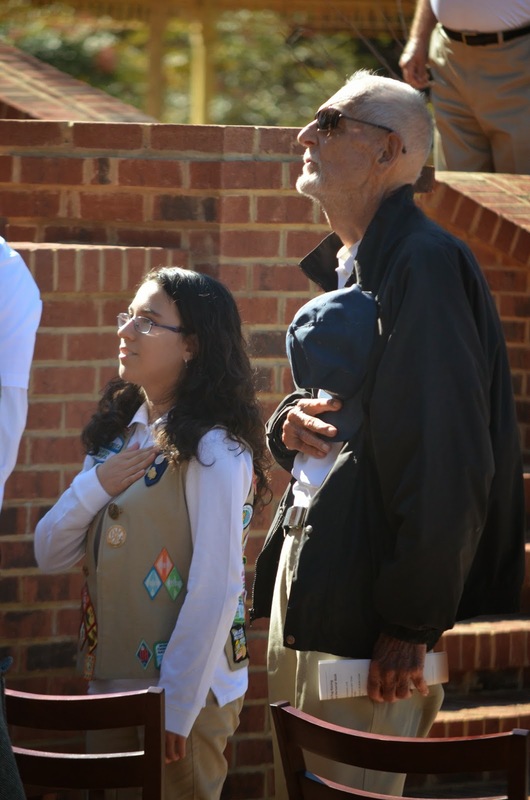 Specifically, my goal for my Girl Scout Silver Award project was to raise $13,000.00 for the Women in Service portion of the Johns Creek Veterans Memorial Walk. 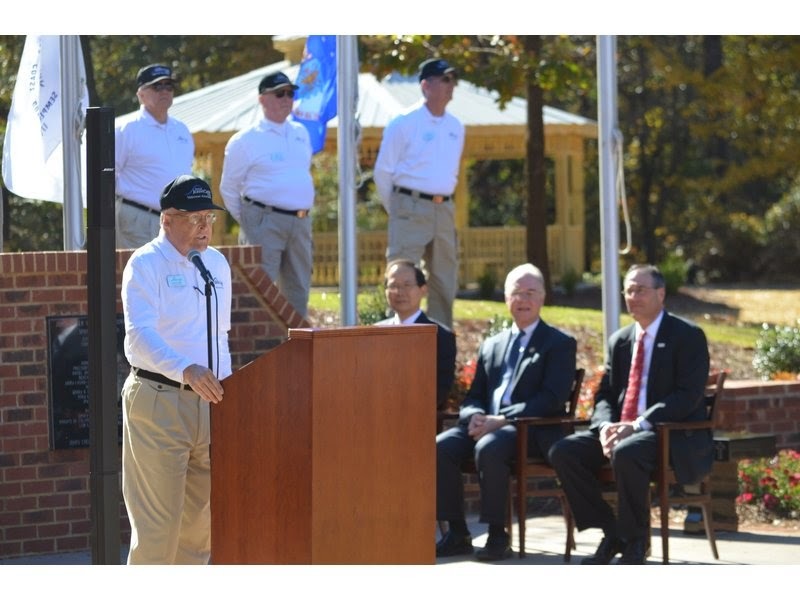 On Friday November 7th, 2014 the Johns Creek Veterans Association held the official flag raising ceremony. In the presence of over 700 people I stood proud, along the veterans and city officials responsible for this memorable event. There were several dignitaries who attended this grand event to include Johns Creek Mayor, Mike Bodker, U.S. Congressman Tom Price, Georgia’s State Senator John Albers, and over 10 mayors from surrounding cities. For achieving my goal, I was deemed an honorary member of the Johns Creek Veterans Association, and I was partnered with the oldest World War II veteran in the JCVA to lead the pledge of allegiance. After the ceremony, everyone took a tour of the fabulous walk. Many people congratulated me that day, but it was most rewarding to at long last see the Women in Service plaza for the first time. The black marble shone and glittered as several passersbys stopped to admire its true beauty and meaning. My Girl Scout Silver Award has undoubtedly been a long project, but the journey has definitely made it all worth it. Even though I have received many accolades, was featured in several newspapers, and interviewed for Channel 2 Action News; the best memory of this journey was the opportunity to meet so many inspiring people, gain new skills, and hear so many stories of true Courage, Confidence and Character. I could not have accomplished this extraordinary goal without the support of several people. I want to take this opportunity to thank everyone who encouraged me along the way. I am thankful to my parents, sister, family members, friends, and teachers who supported me throughout this journey. Many businesses including Jackson Healthcare, Excel Federal Credit Union, Dentistry at Rogers Bridge, and Peach State Federal Credit Union, have been a huge help. I wouldn’t have been able to do achieve my goal without them. I would especially like to thank the Johns Creek Veterans Association and their president, Wayne Kidd, and former president, Gerry Lewis, for allowing me to partner with them and for always believing in me. I also want to thank the Girl Scouts for giving me this wonderful opportunity to help my community. However, my biggest thank you goes out to all the Veterans because they sacrifice so much in order to keep our country safe. By completing this project, I hope to inspire people, especially teens, to take action in their community. No matter what people may say, you are never too young to make a difference in our world! So, whether you’re working on your Girl Scout Bronze, Girl Scout Silver or Girl Scout Gold Award, I encourage you to think big. It has been a pleasure, and I look forward to starting my Girl Scout Gold Award project next year.